How to wear jewels in winter? As the temperature lowers, the amount of fabric around our bodies grows. Layers pile up, knits get thicker, necks get hidden with collars and scarves, etc. There seem to be no room left for any jewels in winterland and they often are forgotten in seasonals outfits. Which is a shame because jewels can really contribute level up the looks without lots of skin to display. Of course, small jewels are very pretty every season, but today, I want to talk big stuffs that are seen from a distance. They are the ones that are really able to change a silhouette. The most important thing is to choose jewels that match your outfit. Statement earrings look good on ladies with long necks and defined jawline. Otherwise, they’ll draw the attention on an area that may not be your best asset. Earrings are great in winter because they alway show, even if your neck is rolled in a huge plaid scarf and your head covered with an oversize beanie. Be careful, that the earrings actually “pend” and do not “bend” on your scarf or collar. I think oversize earrings look especially great with turtlenecks, chimney collars and chunky scarves. They could be pendant of short (earcuff, 80’s big studs, etc…). 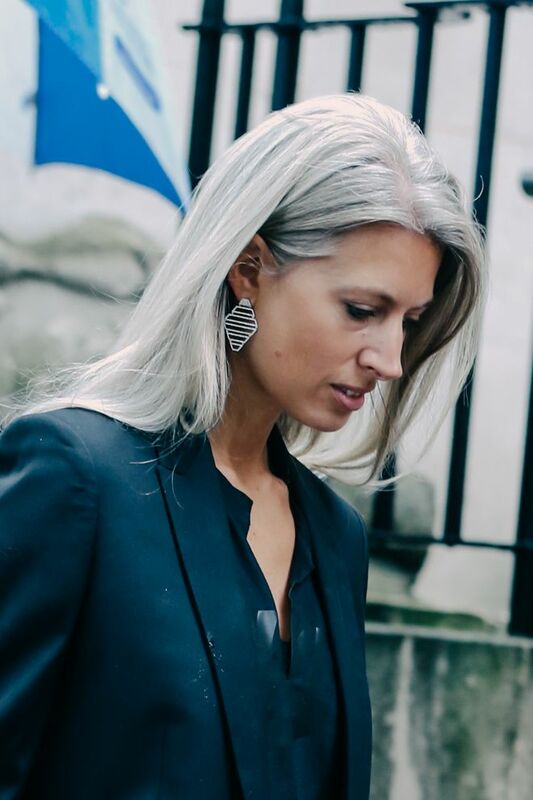 If you go for pendant oversize minimal earrings you can wear either one or two of them. And – don’t ask me why – but this trick doesn’t work with bohemian or baroque style nor with shorter pendants (to my own personal taste at least). 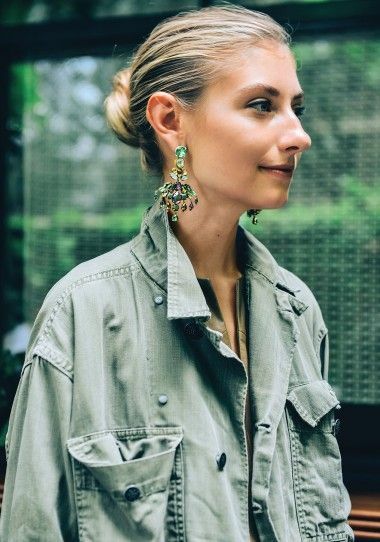 I love the contrast between the super casual jacket and the sophisticated, quite kitsch earrings. Punky B bohemian statement earrings worn plural. They really give attitude to this soft cocooning outfit. No matter if pendants or chokers, my advice is to choose them big enough to be noticed on a thick fabric as a knitted jumper. If you go for a thiner version the shine is a good alternative to be sure your necklace stands out. I think necklaces are the perfect ally to spice up an oversize jumper that, otherwise, appears as a vast and blank canvas. I also like blank canvasses, do not misunderstand me 🙂 But it’s nice to style them in different manners. Your wrists may or may not be covered and your hand are probably bare assuming you are inside. 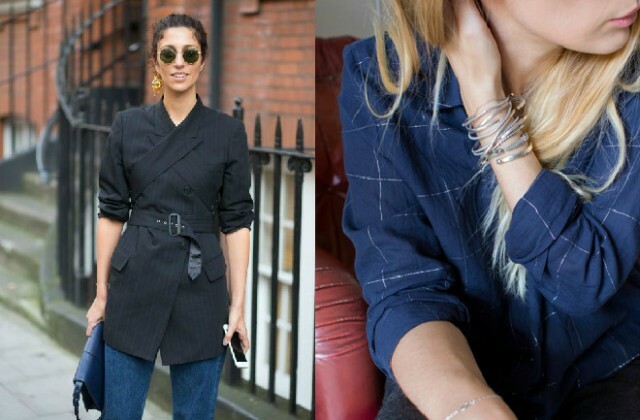 Regarding bangles and cuffs, you could go for the layering style, cuffing your sleeve with your bracelet. Again, picking slightly massive jewel will be the way to go to make a style statement. 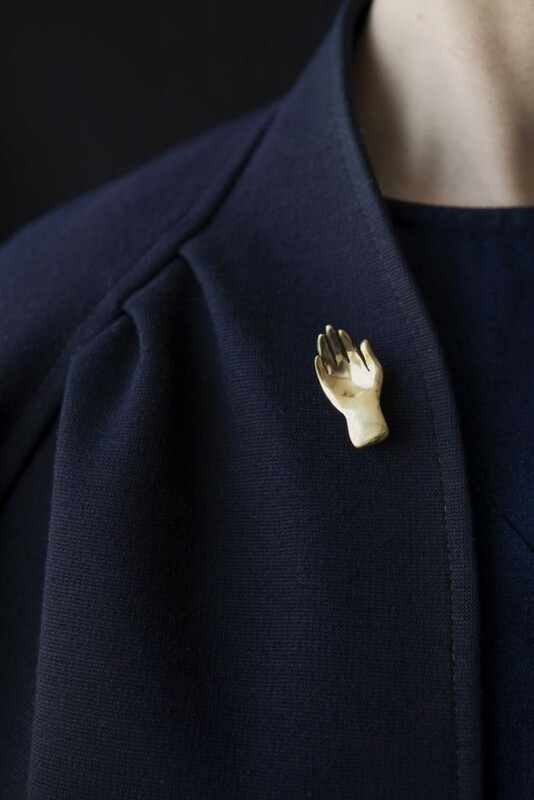 The brooch are perfect to make a piece of clothing become unique. You can either buy them new or find them in flea markets or vintage shops. They will be your personal signature. And you? How do you wear your jewels in winter? Comme indiqué dans ce post , exceptés pour la manchette (sur un pull) et les broches. Dans le 1er cas, il faut trouver celles acceptant un tour d’avant bras “costaud” Et dans le 2eme, il faut essayer de faire sauter un apriori ( dans mon cas) broche= mamie jeannette. Il faut je pense tomber sur celle qui me fera dire ” voilà c’est ca “. Chez Macon et Lesquoy (nono je ne fais pas leur pub) il y en a plein qui ne font pas mamie Jeannette. Merci pour cet article sur les bijoux, avec des illustrations très inspirantes comme d’habitude ! Je suis fan des grosses boucles d’oreilles en cuir de SartoJ . Il y a plusieurs couleurs au choix et les oranges se sont révélées étonnamment portables avec tout, plus même que les noires à ma grande surprise, parce qu’elles apportent une touche de couleur dans mes tenues. Une autre question: je déteste repasser et n’achète donc jamais de chemise. Comment être chic au bureau sur une base de t-shirt noir Petit Bâteau (ou bleu marine, soyons fou !) ? Article sur les T-shirts au taf is coming dans le lookmaker. J’adore les bijoux que tu as mis en lien.